A paper mache yellow school bus on display in the hallway at Lincoln Middle School with photos of all teachers of the school Thursday, May 24,2018. 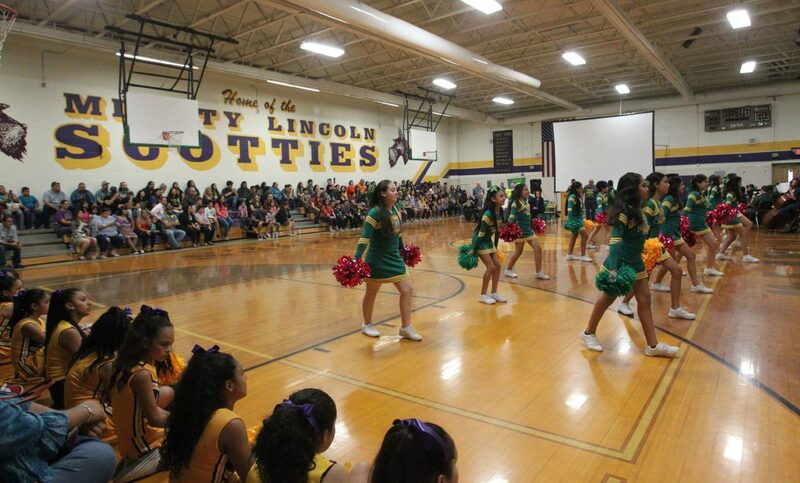 McALLEN — In a sort of pep-rally, current and former students, teachers and staff of Abraham Lincoln Middle School gathered at the school’s basketball court Thursday afternoon to bid farewell to the campus as the home of many generations of Scotties. 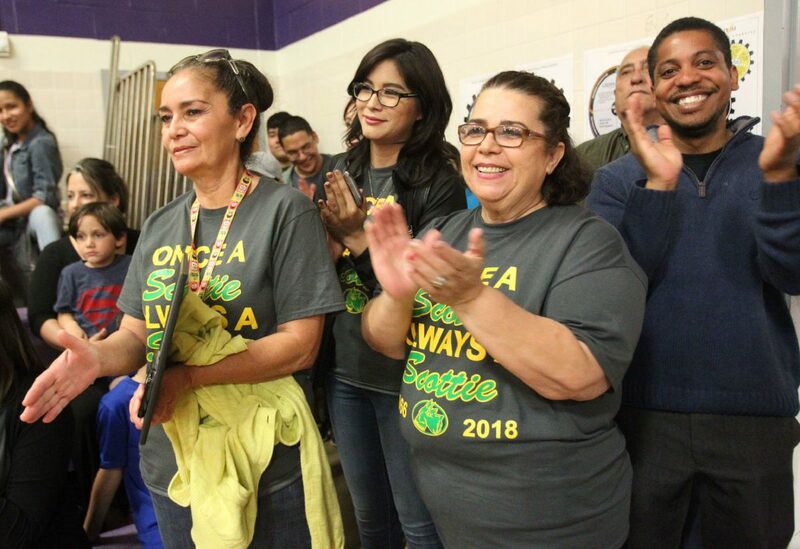 Teachers and staff sported grey T-shirts with big green and gold letters that read, “Once a Scottie, always a Scottie, 1966-2018,” as they recognized teachers with long tenures and watched their children perform in the cheerleading squads and orchestra. And many of those who also called it home shared memories with about 400 attendees of all ages, who were in some way or another related to the Lincoln family. As per a recent decision by the McAllen school district board of trustees, the campus will begin the 2018-19 school year as the new home for Achieve Early College High School. Students who are still coursing middle school will be sent to De Leon, Travis and Fossum, while teachers and staff will also be reassigned within the district. 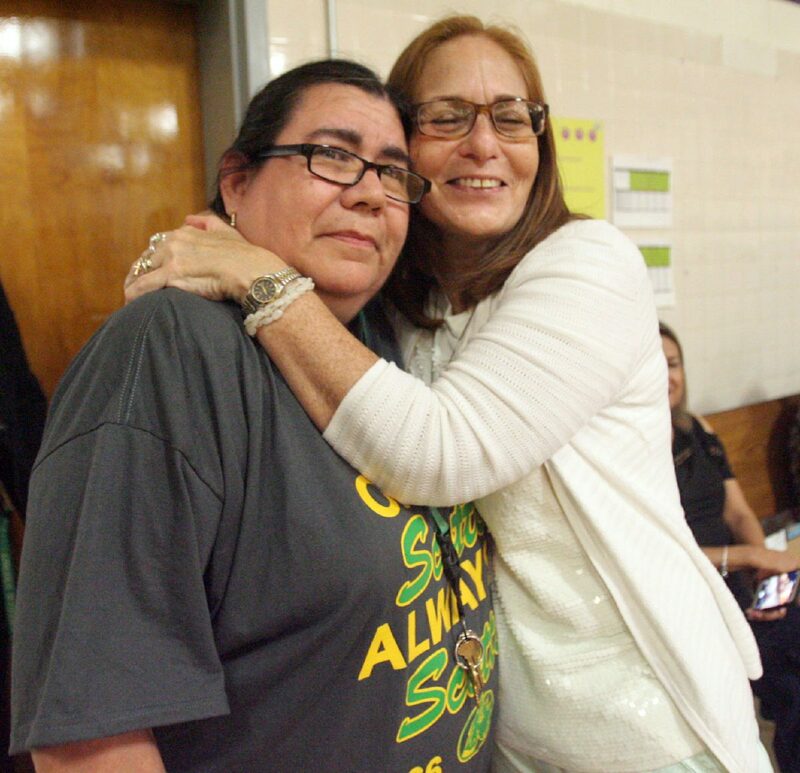 Maria De Lourdes Nunez is hugged by Elma Pinor during the farewell event at Lincoln Middle School in McAllen Thursday, May 24,2018. Nunez started teaching as a substitute teacher in 1988. 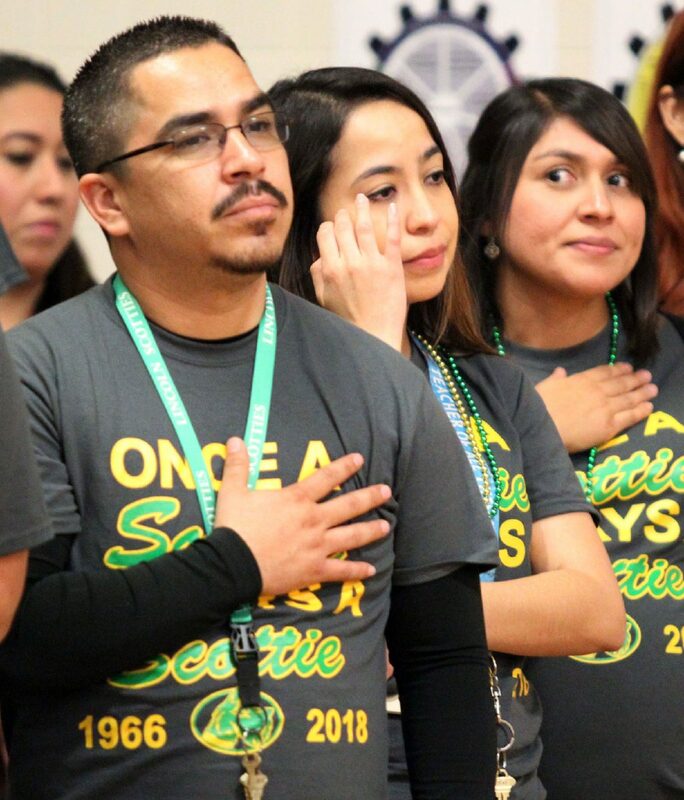 Ignacio Negrete, Elizabeth Guerrero and Stephanie Castillo during an emotional playing of the National Anthem at Lincoln Middle School farewell event in McAllen Thursday, May 24,2018. 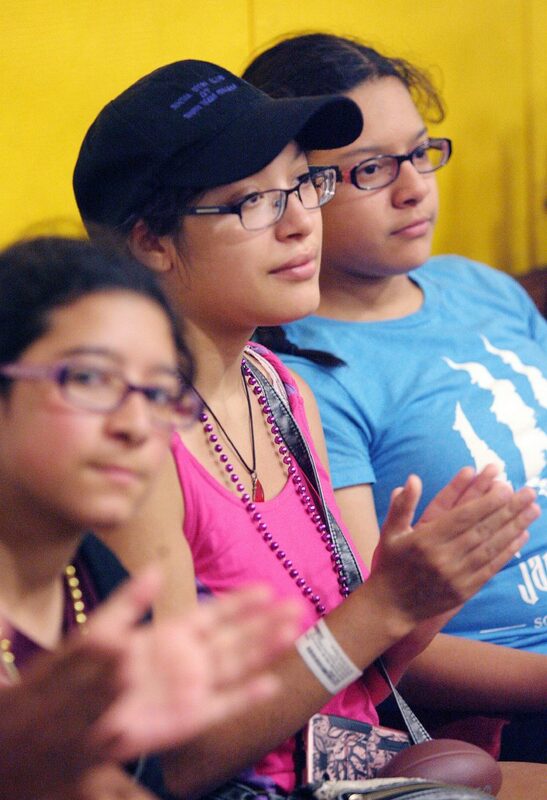 Sisters Merissa Martinez,12, Sarai Leal,20 and Ashley Martinez,14, students and formers students of Lincoln Middle School celebrate the farewell event ceremonies at the school in McAllen Thursday, May 24,2018. Cheerleaders from Lincoln Middle School cheer during a farewell event in McAllen Thursday, May 24,2018. Lincoln Middle School teachers , Ivonne Cerda, Iriam Hernandez, Lourdes Arrambide and Jose Hidalgo clap during a farewell event for the schools transition into a high school in McAllen Thursday, May 24,2018. A visibly emotional and teary-eyed Principal Maribelle Elizondo said she has tried to keep the message positive for her entire Lincoln family — composed of students, parents, teachers and staff — as not everyone was happy with the change. But it was the parents who thought about the event and put it together, she said, as one last big celebration open to the entire community. Former principals were present on Thursday including Rosalinda Martinez, who led the campus as principal for 20 years — from 1990 to 2011 — before her retirement. Superintendent Jose Gonzalez also had a beginning of sorts at Lincoln, he recalled, as the campus was home to his first administrative position as assistant principal under Martinez between 1999 and 2003. All of her staff and teachers have already been placed within the district, Elizondo said, it is only her and her leadership teams that will be assigned until the end of the year. Her position, which she has held for the last three years, and that of her assistant principals might change, she said, as they will be placed in either same role in other campuses or in other administrative positions. And while uncertainty might not be easy to handle, she said she has faith that her and her entire team will land in good places.